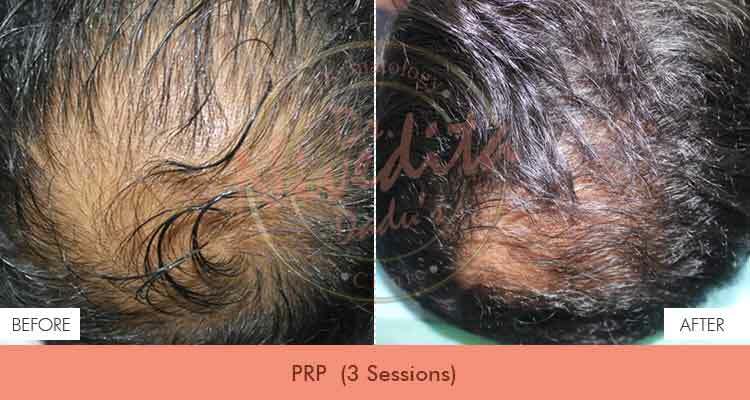 PRP for hair fall in Delhi is a popular 3-step method for hair fall, which involves drawing patient’s blood, processing it and then injecting it back into the scalp. Once the blood is drawn, it is processed to make it platelet rich and then the platelet rich blood is inserted via an injection into the problem areas on the scalp to organically support hair growth. It is considered that the PRP treatment for hair fall triggers natural hair growth and increases the thickness of the hair shaft. Sometimes PRP therapy is combined with other procedures and medications for better results. As this hair fall treatment involves injecting your own blood into your scalp; the risk of getting infected reduces by leaps and bounds. However, any treatment that involves injection could cause scar tissue, calcification or cause injury to blood vessels. The therapy normally consists of 3 treatments spanned meticulously in 4-6 week period along with maintenance treatments that happen every 4-6 months. The cost of PRP treatment for hair fall in Delhi depends on a number of factors including the equipment used and the addition of nutritive components. PRP can be injected in several ways. Sometimes a topical numbing solution is applied to your scalp before the injection and you may have to arrive early for the treatment to get this applied properly. In some cases, the specialist mixes local anesthetic with the PRP to reduce any possible discomfort during the procedure. As part of the PRP process, the doctor often uses imaging such as ultrasound technology to spot specific areas for injection so that he/she injects the PRP into the most responsive areas of the scalp and give way to optimum results. If you wish to bid goodbye to your hair fall problems and instigate natural hair growth then opt for a PRP treatment for hair fall in Delhi. At Dr. Nivedita Dadu’s Dermatology Clinic in Rajouri Garden, West Delhi, we always emphasize on finding out the root cause of the hair fall first and then determine a perfect solution for you. Knowing the underlying causes enable us to provide you with exact medical advice and treatment for better and faster results. One of the best hair transplant clinic for PRP. Highly recommended for any type of hair treatments.